Our Clubhouse offers golfers, old and new a warm welcome and is available to hire for private functions. The brick Clubhouse with its huge green roof dominates the scene from its central position. Inside, a large lounge welcomes you and glinting bottles behind the bar tempt even the most abstemious A comfortable coffee lounge and patio area provide an alternative seating area. A spacious kitchen provides excellent fare at social events. Upstairs are the changing rooms and showers. Returning to the ground floor, the secretary's office, back office and staff room complete the accommodation. 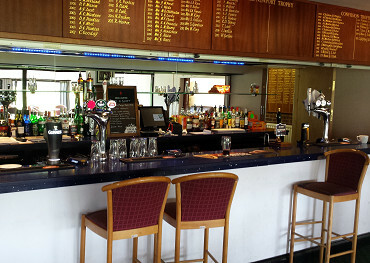 The Lounge Bar is traditionally where the members spend time after a game of golf enjoying a drink from our excellently stocked bar and using the opportunity to discuss a wide range of topics or the putt that got away! You only have to enter the bar to get the feel for the really friendly atmosphere for which Maldon is renowned. 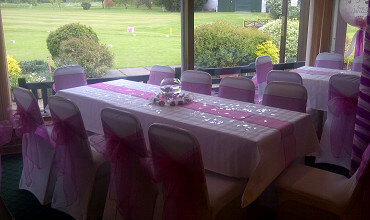 At Maldon Golf Club we are able to cater for special occasions for up to 100 persons depending on the type of function. Any catering requirements are carried out by our caterers on site in a well equipped kitchen to an excellent standard. Whether your function is a special birthday, wedding celebration, anniversary or any other celebratory event we can provide a venue and complete package for you.